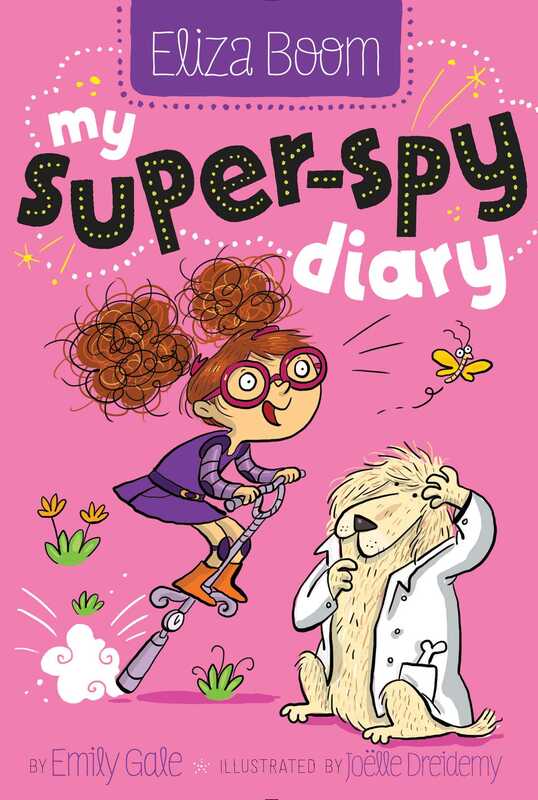 Eliza Boom—assistant inventor, junior spy, and full-on fantastic—investigates a case of puppy love in this second book of a chapter book series packed with jokes, doodles, and dear-diary secrets! When Einstein, Eliza’s faithful (and furry) lab assistant and best friend (and dog), falls in love with the next door neighbor’s dog, Eliza only wants to help smooth the path to happiness for the canine pair. Unfortunately, the new neighbor, Mrs. McNice, seems to have other ideas. In fact, Eliza is convinced that Mrs. McNice isn’t as nice as she seems. But no one will believe her. Can Eliza invent the perfect gadget to help her reveal the truth? Or is Einstein’s budding romance doomed to failed puppy love? My Super-Spy Diary Monday Morning My Lab, 7 a.m.
Let me explain. It all has to do with my new invention. Lately I’ve discovered that I can invent POTIONS as well as GADGETS. My first potion was for my best friend, Amy. She desperately needed my help. Amy’s mom had washed her hair in mayonnaise after reading on the Internet that it kills lice. So I decided to create Egg-Away Shampoo (Potion No. 1) for Amy. I thought about what girls smell like . . .
. . . and used all those things in my potion. Finally, we were ready for testing. Step 1: Saturate test material (wet Amy’s hair). Step 2: Apply substance (rub in the shampoo). Step 3: Flush excess substance (rinse it all off). Step 4: Dehydrate test material (dry Amy’s hair). Then I discovered that someone else had a smelly problem. Alice, my stepmom, was complaining nonstop about Einstein’s stink. She’s got a nose for trouble. Probably because she’s a spy and strange smells are SUSPICIOUS. Although Dad’s a brilliant inventor, he’s much too busy to make doggy shampoo. So it was up to me to save the day, and our noses. Einstein and I got to work in my lab. First we needed thinking time. I put on some music to help us relax—I always have my best ideas when I’m relaxed. THE MUSIC WORKED! I knew exactly what should go into the potion. Since Einstein is one of the family, he should smell like all of us! It was time for testing. But first I had to ask Einstein a very important question. Not a REAL guinea pig, of course! Guinea pig is the name you give to someone you’re testing an invention on. I knew Poochie-Pooh was going to be fantastic . . . it felt lovely and fizzy on my head. The trouble started when we got to “Step 3: Flush excess substance.” Einstein HATES lots of water. So that’s how I lost my guinea pig. And now I REALLY NEED to find him.